NEW YORK—The name Tiepolo calls to mind triumphant ceiling frescoes filled with floating, tumbling bodies of heavenly beings. But besides a capacity for artistic achievements on a grand scale, Giambattista and Giovanni Domenico Tiepolo also shared a cheeky side. A small installation at the Metropolitan Museum of Art features just over a dozen of the father and son’s ink drawings, from the Robert Lehman collection. The father, Giambattista, had a flair for picking the quirky from the mundane, and exaggerating it. Sitting with paper and ink on Venetian streets, he’d sketch strangers from the back. Judging from these drawings, 1760s Venice was a sartorially happening place. Both men and women wore something called tabaro e bauta—a black cloak, tri-cornered hat, and a white beaked mask—like a cross between the Phantom of the Opera and Darth Vader. While it might have been an impressive costume, Giambattista took their wearers, visually squished them, and gave them long arms until they looked like old hens dragging their wings about. Five such drawings are on display, each showing a surprising amount of character. 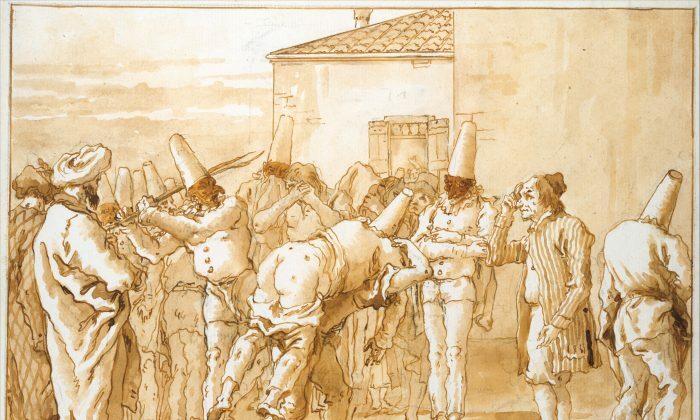 Giambattista’s caricatures are simple and good humored. After his death in 1770, his son Giovanni Domenico (1727–1804) referenced these sketches, and took their hilarity to another level. Domenico had an early start as his father’s studio assistant, but was a late bloomer of sorts, and didn’t start developing his own painting style until he was in his 40s. Domenico’s “Divertimento per li regazzi” (Entertainment for Children), is a series of 104 drawings featuring the trickster character Punchinello. Hunchbacked, potbellied Punchinello is a fixture of the commedia dell’arte, a form of streetside sketch comedy based on stock characters like the cowardly soldier, the grandiose lover, and the sniveling servant. With brown ink, chalk, and his idiosyncratic squiggly pen strokes, Domenico puts poor Punchinello in ridiculous scenarios. Here Punchinello has found a tenuous dignity as a dressmaker; there he is urinating outside a circus. Often Punchinello appears in multiples—an entire gang of them digging up dead birds from a well, felling a tree, being spanked in public (by another Punchinello, of course). He is comical to the very end. Fellow Punchinellos botch his burial by sliding him head first into an opening in the floor, probably with the intention of paving over his corpse with some fresh tile. All Domenico is trying to accomplish by Punchinello’s antics is to show us ourselves. While his father’s work was dominated by lofty themes, Domenico’s make us recognize our fellow passengers on Plato’s ship of fools.